Note: Use together with Gastronic Dr. for chronic digestive disorders or Candidate Drops for digestive problems caused by candida (yeast) overgrowth in the gut. How has Digest Assist helped others? Can I use this product with my over the counter medication? These are all symptoms which we experience from time to time. Causes include diet, food intolerances and allergies (especially to wheat), candida (yeast) overgrowth, digestive imbalance, stress and digestive disorders. If you are occasionally troubled by these symptoms, you can obtain quick relief by using Feelgood Health's Digest Assist Drops, especially formulated for rapid relief of uncomfortable digestive complaints. Taken at the first signs of gastric distress, the herbal ingredients in Digest Assist Drops will quickly and effectively soothe the irritable stomach and remove the burning of acid reflux and heartburn naturally. Chronic (longterm) digestive complaints can significantly affect quality of life and require a more comprehensive and holistic approach. If you have these symptoms regularly, this may indicate incorrect diet, unhealthy lifestyle or one of the conditions described above. For digestive distress associated with chronic digestive disorders like IBS, Crohn's Disease, Gastritis, Diverticulosis, or GERD (Acid Reflux Disease), Digest Assist Drops should be used together with our Gastronic Dr. capsules. Feelgood Health's Gastronic Dr. is especially formulated in capsule form to assist with overall digestive health. Containing herbs especially chosen for their beneficial effect on the entire digestive system, regular use of Gastronic Dr. can help your digestive system to heal itself, reducing and preventing the pain, discomfort and embarrassment of flare ups associated with chronic digestive ailments. There are many synthetic over the counter and prescription medicines to treat digestive complaints and disorders like IBS, Crohn's Disease, Gastritis, Acid Reflux Disease (GERD), Diverticulosis and Ulcerative Colitis. While these synthetic medications may make a big difference to quality of life for people suffering from digestive disorders and dysfunction, many also come with side effects like nausea, vomiting, heartburn, headache, diarrhea and even greater risk of infection. Immunosuppressant drugs may also lower the body's natural resistance to illness. Recognising the need for a healthier and more effective approach, without the side effects of the prescription drugs, Feelgood Health has developed Gastronic Dr. and Digest Assist - both 100% herbal remedies containing well researched ingredients and manufactured in therapeutic dosage according to the highest pharmaceutical standards. Taken regularly, Gastronic Dr. safely and effectively acts to improve digestive health, reduce inflammation and reduce and prevent the symptoms of digestive disorders. Digest Assist, which comes in fast acting and convenient drop format, is the perfect companion to Gastronic Dr, quickly and effectively putting an end to acute symptoms of digestive distress like heartburn, nausea, gas, flatulence, indigestion, reflux, etc. Recognizing the need for a natural, healthy, and effective approach for trouble-free digestion, we developed DigestAssist - a 100% herbal remedy containing well-researched natural ingredients and manufactured in therapeutic dosage according to the highest pharmaceutical standards. DigestAssist can be used to promote healthy digestion and balance digestive problems, creating harmony in stomach, digestive tract and bowels. This remedy comes in fast acting and convenient drop form, and can be taken as needed to support digestive comfort after meals, helping you to enjoy your food every day! "I have struggled with IBS for years and years and used to despair that I could lead a normal life. My doctor told me to 'live with it' . I wanted to let you know that I have tried a huge number of 'solutions'' including natural remedies and prescription medicines, but none have come close to helping me like your products have. I take Gastronic Dr. every day and I NEVER go out without the DigestAssist Drops! If I do have an attack I can control it quite quickly and the symptoms are far less severe. I have to confess that I smoke and like my toddy at night, but I think that if I reduce or stop this as advised by Michele, I will finally have complete relief, no thanks to my doctor but lots of thanks to Native Remedies!" Digest Assist contains the following therapeutic herbs in convenient and fast acting drop format. Zingiber officinale, commonly known as Ginger, has a long history of medicinal use in traditional Chinese and Ayurvedic (Indian) medicine. Modern research confirms its effectiveness in relieving the symptoms of nausea, vomiting, indigestion, flatulence and dizziness. Working mainly in the digestive tract, Zinziber boosts digestive fluids and neutralises acids, making it an effective alternative to anti-nausea medication, but without the usual unpleasant side effects. Zinziber has strong anti-inflammatory and pain relieving properties and is also used to treat arthritis and other inflammatory diseases . Foeniculum vulgare, also called fennel, was a favorite herb in medieval times and was used to stop stomach rumbles and colic. It was commonly used after meals to prevent flatulence, indigestion, colic and other digestive problems. Fennel has strong calmative and anti-inflammatory properties. Mentha piperita, one of the most effective of the mint herbs, has been used for centuries to relieve indigestion, nausea and heartburn. Modern research has demonstrated its effectiveness in soothing the symptoms of diverticulosis, IBS and other digestive disorders. Mentha piperita is widely cultivated for medicinal uses and also has anti-inflammatory and anti-spasmodic properties. It relaxes the muscles of the digestive tract and stimulates the flow of natural digestive juices and bile, thereby assisting healthy digestion. Pelargoneum graveolens, also known as 'maagpyn bossie' (stomach pain bush) is a traditional medicinal herb used by indigenous people of South Africa. It has a wide variety of uses and is an effective calmative and anti-spasmodic herb, reducing stomach cramps and pain. Like all Feelgood Health products, Gastronic Dr. and Digest Assist are developed with care by our practising Clinical Psychologist, are 100% natural and are manufactured according to the highest pharmaceutical standards. Individual ingredients are well-researched and have been put to the test over the years as a complement to the treatment of real people with real problems. The herbs used in Gastronic Dr and Digest Assist have a high safety profile and there is no evidence to suggest any negative interaction with prescription and over the counter medication for digestive disorders. You may find that you need far smaller doses of your usual medicine and may even be able to discontinue it altogether as flare ups become less frequent. As always, consult your doctor before discontinuing or changing any prescription medicine. 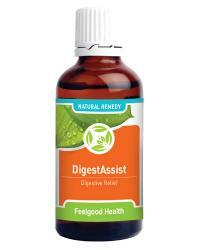 The ingredients of Digest Assist have been especially chosen to provide rapid relief from symptoms of digestive distress. Take your Digest Assist Drops with you to use directly after meals for fast and effective relief and at the first signs of digestive pain or discomfort. No Reflux Combo! Soothe acid reflux for easy digestion!